Theresa May is undoubtedly a intelligent lady: not only is she an educational and political high-achiever – and only the second woman to succeed to the Office of Prime Minister – but she has risen to the top having overcome significant setback and personal adversity. There was the premature death of her father in a car crash; then of her mother the following year with multiple sclerosis; then the disappointment of childlessness, and all this while coping with Type 1 diabetes. The Home Office is a punishing brief, especially for Conservative incumbents, yet she occupied that position through multiple controversies and become the longest holder of that Office in 60 years. Whatever else she may be, she is unquestionably a survivor. Like Margaret Thatcher before her she drew strength from being insulted, most notably by Kenneth Clarke who called her a “bloody difficult woman”. It is often an advantage to be underestimated: she seemed to revel in the description, and this could go a long way to explaining the resilience and inflexibility she is currently displaying in the pursuit of Brexit. To plough on with her seemingly ill-fated ‘Withdrawal Agreement’, having faced down votes of confidence from both the Parliamentary Conservative Party and the whole House of Commons, has drawn a certain respect and admiration from friend and foe alike. Despite herself having Remain inclinations, if not convictions, and despite being well short of a parliamentary majority, she has refused to veer from her insistence that the EU Referendum result must be respected, as must the ‘red lines’ that flow from it. She is relentlessly pressed to surrender some of those principles in order to break the current impasse, yet she insists on the UK’s sovereign autonomy in respect of immigration, its legal independence from the ECJ, no further contributions to the EU budget, and the need to acquire freedom to negotiate trade deals around the world. Some warn of the risk of becoming trapped in the backstop, yet she evidently believes that risk is overrated. Such determined intransigence is remarkable. Whether one agrees with her or not, how does she sustain it? One might speculate that a bloody difficult woman might be fortified by the provocations of Speaker Bercow and former Attorney General Dominic Grieve: many a strong woman digs in when confronted by such obstruction. Yet although this might account for a renewal of resilience, it does not explain the origins. To understand this, one needs to turn to one of the earliest descriptions of her character: she was “the grammar school girl who always did her homework”. And then there’s that pervasive media description of her upbringing: she is “the vicar’s daughter”. Perhaps these were intended to be pejorative, but combined they offer some insight into her character. A woman with such a backstory is likely to be naturally accepting of the rules, and to regard them as a helpful matrix, a secure basis of security which, in combination with patience and determination, offer a well-trodden path to success. She is no natural rebel, not an obvious innovator, and certainly no snowflake. Tough times are to be overcome, especially when it is her duty to see the task through. In this regard she has something in common with the Queen, with whom she has regular meetings. At the age of 92, few would blame Her Majesty if she decided to stand aside from her duties, conferring them on younger shoulders while she takes life a bit easier. But she swore an oath at her Coronation, having previously pledged in her 21st birthday that her whole life would be devoted to our service. She plainly intends to see it through. 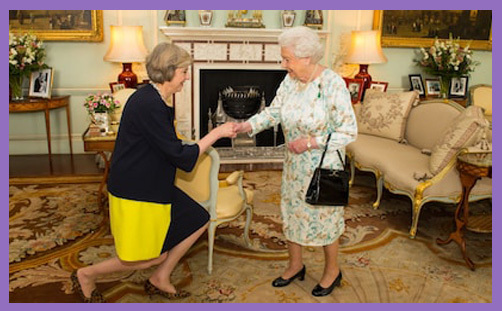 There is perhaps an innate or nurtured degree of doggedness in the two women, and that spells trouble for those seeking to overturn the only people’s vote that matters – the 2016 EU Referendum. It is worth reminding ourselves that when it comes to the Queen and the EU, she is by no means green. Her Majesty has not only known every prime minister since Churchill, and listened patiently to their opinions, concerns and advice; she has also met with Adenauer, De Gaulle, Mitterrand, Kohl, etc., etc. Indeed, she has met more and better-informed people than any politician in the world. She remembers when she succeeded to an Empire that ruled a quarter of the globe, and much of the Commonwealth still regards her as a true and reliable friend. Presidents of the United States shuffle nervously before meeting her, and undoubtedly see her as a wise and trusted ally. Try telling Her Majesty that her country is an insignificant island or a fifth-rate power quite unable to hold its place in a competitive world – politically, diplomatically, economically or militarily – and you might receive a terse riposte. No doubt historically, like the rest of us, she was assured by John Major inter alia that we had retained our essential national sovereignty, and so she expected it to be exercised when her subjects expressed their view after being asked a plain question: “Should the United Kingdom remain a member of the European Union or leave the European Union?” No doubt someone who knows the Constitution and the British people as well as she might recall how the electorate responded in Winchester back in 1997 when a victory by two votes was overturned by the courts, only for the re-run to be won by the same victor Mark Oaten by a landslide 21,556 majority. The British people respond robustly to cheats. Now what may pass between the Queen and her current Prime Minister does, of course, remain strictly confidential, but reflecting upon their known shared values and characteristics, it is surely not unduly fanciful to surmise that if Theresa May were receiving contrary advice or warning from her most trusted and well-informed confidante, she is more likely than not to have taken it. The two ladies are undoubtedly committed to keeping good faith with the ordinary people of the country, who have repeatedly demonstrated that they have the ability to understand the core issues and, when asked, to express themselves with admirable clarity. Let there be no doubt, the servant Queen perceives herself in terms similar to the Good Shepherd, who puts the interests of her charges at the highest premium. If the Speaker chose to allow this rule to be dispensed with or ignored, that could have unpredictable, and potentially horrific, constitutional consequences. It could raise a question whether the Government would be entitled or might feel required to reassert its constitutional veto by advising the Queen not to grant Royal Assent to the Bill. How should the Monarch react to such advice? The answer is not straightforward and the prospect of it needing to be considered in a real life political crisis is unthinkably awful. It is a sacred duty of all UK politicians not to involve the Monarch in politics. They have a constitutional responsibility to resolve difficulties between themselves in accordance with the rules, and so as not to call on the ultimate referee. With such advice available, those threatening the well established constitutional proprieties would do well to reflect that the voters of Winchester in 1997, and many more millions like them, are now within the cohort dismissed with such contempt by hard-line Remainers. If push comes to shove, the people’s grievance is more likely than not to be heeded by the Prime Minister who, whatever her failings, appears to be rooted in a moral conscientiousness. Offered an option, even an extremely difficult one such as proroguing Parliament if that is the price of keeping faith with the people, her core integrity is likely to impel her to respect that Referendum vote and contend for its fulfilment, come what may. Paying the unthinkable price with a happy outcome, is, of course a well established biblical principle.